When I was growing up in the north-east of England in the 1960s, we had a little blue and white collecting tin on the shelf in our hallway. Printed on one side was a stylised map of Israel and the Hebrew letters for JNF, or Jewish National Fund. In the top was a slot for coins and, impressively as £1 was a lot in those days, a little hole you could push a rolled-up banknote through. The idea was that, even from faraway Middlesbrough, we could all contribute a little of what we had to the Jewish state. I never saw much money put into the tin – I guess my parents sent a cheque instead – and I couldn’t really understand why Israel needed our help. The pictures we were shown at the synagogue Sunday school were of happy children running around under bright blue skies, which looked a lot better than the rain-blasted, slate-grey days we endured for much of the year. In fact, even as I got older, I never really got to grips with the idea of Israel as a reality. In my mind the little strip of land along the eastern Mediterranean coast was much more suited to the role it had played in Jewish consciousness for 2,000 years: a symbol, a repository of the longing, regret, hope and introspection that for me made the Jewish faith so potent. I wanted the Israel of Abraham, Isaac, Rachel and Rebecca. After all, I could get falafel in Camden Market. When I started travelling on my own I found there were other reasons not to visit Israel. Israelis I met abroad often seemed arrogant and ill mannered, tramping into Buddhist temples with their shoes on in south-east Asia or pushing to the front of queues for ferries or planes. The political situation in the region was, for a young liberal, at best problematic. And while I was, and am, happy enough in my Judaism – going to synagogue, celebrating the festivals, finding time for some theological reflection – loyalty to Israel seemed to come as some sort of obligatory extra that I hadn’t asked for. Yet Jews can’t escape Israel’s spiritual pull and, for much of my 20s and 30s, I circled around it, travelling in the Islamic world, in Morocco, Tunisia, Egypt, Jordan, Iran. There, in a kind of pan-Semitic idealism, I found echoes of the synagogue service in the chanting of the Koran. There, the landscape seemed more biblical than the greened deserts and kibbutz enclosures of Israel itself. And there I could pretend – or I thought I could – that much of the Arab world wasn’t threatening to push the Jewish homeland into the sea. I had developed a fairly voyeuristic habit of searching out synagogues in Islamic countries, only to run away in embarrassment when I realised how desperate the situation was of the Jews I met there. In Isfahan, in the south of Iran, I found a sorrowful, lonely community desperate for new blood or escape, or both. Anyone who could afford it had emigrated to Israel. The Rabbi, tears running down his face, showed me his dusty, dying synagogue and almost forced his daughter’s hand on me in a panicky attempt to get her out of the country. I was embarrassed, helpless and appalled and, as I made (yet another) hasty exit, stuffing money into his hand from the wad of useless Rial notes I had in my pocket, I knew I had to end all this prevarication and pay a visit to The Land, as it is invariably known in modern Hebrew. Which was how, this February, I boarded an El-Al flight to Tel Aviv and five days of self-discovery. Istanbul is usually held up as the archetypal mixture of east and west, but for me Tel Aviv was like a butterfly, constantly flitting between Europe and Asia, old and new, never quite settling down, always questioning its identity. It was Friday night when I arrived and while my hotel had a shabat lift that automatically visited every floor, so orthodox Jews wouldn’t have to operate an electric switch on the sabbath, the city itself was revving up for a secular weekend. Sure, a few people were walking back from synagogue, but mostly it was groups of slightly Eurotrashy young clubbers bustling down the boulevards from bar to bar and their parents hailing cabs outside some very New York-looking restaurants. But bars and restaurants I could get in Europe. 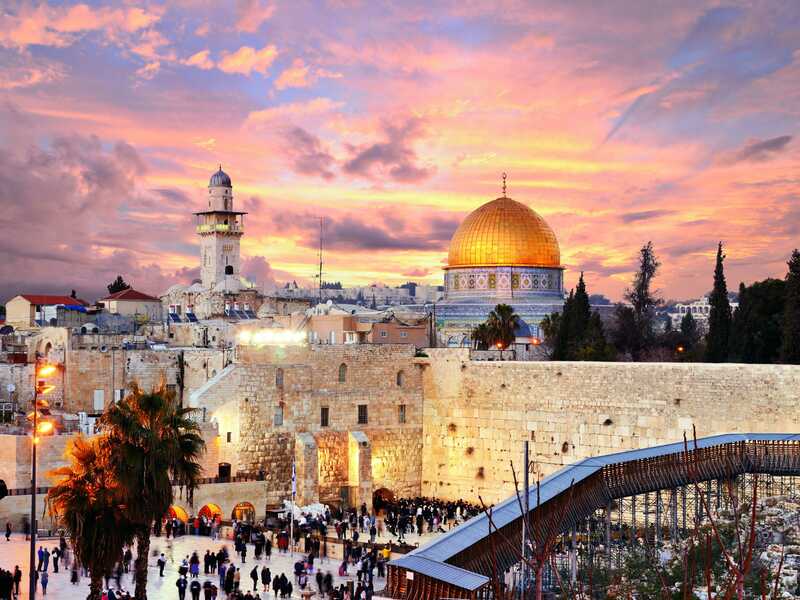 As I walked the next morning in the glorious February sun, I realised that, like so many visitors to the Middle East, I had really come to Israel to find something of my God. And for that I needed to go back in time. Take a stroll along the boardwalk that runs the length of Tel Aviv’s golden-sanded beaches and, in 5km, you can cover 4,000 years. At its northernmost point is a brand new marina, with young families, open-air restaurants, European-style bars and an ultra-modern centre for women. But walk south, past the towering tourist hotels, the commercial centre and the city’s Bauhaus downtown and in a blink you find yourself in the ancient port of Jaffa. I had high hopes for Jaffa. Its origins lost in prehistory, this is where Jonah set off on his ill-fated voyage, where the cedars of Lebanon arrived to become the doors of Solomon’s great temple, where thousands of pilgrims disembarked on their way to Jerusalem. Yet when I got there I found it strangely unsettling. The old town, scrubbed up and restored, is home now to carefully selected artists and their galleries. Some fishermen still sell their catches on the dockside but theirs seem to be little more than a cameo role (the commercial port closed after the Arab Revolt of 1936). And for someone used to the bustle of Arab medinas, Jaffa is far too quiet. You do wonder where the Arabs live now. In fact, signs of Israel’s conflict with the Arab world are everywhere. Security guards scan you with a metal detector on the way in to almost every public place. I was in the country just after Hamas had won power in the Palestinian Authority and in conversations in bars and cafes I was reminded of residents of a gated community peering anxiously over the fence. And everywhere there was the fear of being abandoned by the rest of the world. “You will write something nice about us, won’t you?” said one woman I met on a downtown Tel Aviv walking tour. For secular visitors to Israe,l Tel Aviv is a destination in itself. But, for those on something of a spiritual quest, it is just a stepping stone to perhaps the greatest sacred city in the world, Jerusalem. So the next morning I climbed aboard an air-conditioned Eged bus and headed south. Like Los Angeles, Jerusalem is a city you feel you have arrived in long before you actually get there. Geographically, it spreads its suburbs far outwards in little white and off-white housing developments over low-slung hills. Spiritually, though, for almost four millennia its influence has filled the western world. This, for Jews, Muslims and Christians, was quite literally the centre of the world, the place where Abraham was ready to sacrifice his son, where Jesus rose from the dead, where Mohammed began his night journey. Like all great religious sites, it was a place where heaven and earth came a little closer – and if you stop to listen, you can feel it pulsing with the transcendent. As I pushed my way through the crowds outside the bus station – soldiers, Orthodox Jews, women overladen with shopping – I took a wrong turn and, instead of walking in the direction of the famous Old City and the Temple Mount, I found myself 180° out, heading towards the suburbs. I turned around and went back past the bus station but, when I checked the map again, somehow I was still walking away from the centre. It turned out that my map had a misprint, but it felt as if the city was warning me not to approach too lightly, the streets somehow turning under my feet. This was, after all, a place pilgrims came to in a state of ritual purity. Tel Aviv you can drop into, Jerusalem, I was discovering, requires more care. The following morning I awoke before dawn to go to the Western Wall, the only remaining part of the Jewish temple destroyed by the Romans in AD70 and, according to rabbinical legend, the place where God’s presence still resides. There is a sense of sacred and the mundane at the Western Wall. You approach the site through an airport-style metal detector and down into a large honey-coloured plaza. Notices around the area ask you to respect the holiness of the place and, on sabbaths and festivals, not to use your mobile phone or camera. And then there stands the wall: sandy-coloured, oddly featureless, surprisingly low, one of those places that works better in photographs than in reality. Clustered around little reading desks, groups of ultra-Orthodox Jewish men (the women are to one side behind a screen), dressed in that time-freezing, 18th-century garb of long black coat and heavy suit, were swaying back and forth in prayer. Dotted about the place were little carts where you could pick up a prayer book and a skullcap. Then there was the wall itself. This was, ostensibly what I had come for. I squeezed through, put my face up against the stone, shut my eyes and felt – precisely nothing. I looked around me. A couple of feet down, a young boy, maybe 11 or 12, was rocking back and forth in ecstatic devotion. To my left a man stared as if in rapture at the stones in front of us. A group of soldiers was saying the mourners’ kadish in unison. A old man in a tight-fitting, shabby suit left the area walking backwards so as not to turn his back on the wall. But I felt nothing for the place. I am Jewish but, for the people around me, I knew, I was not Jewish enough; observant, but not observant enough. I left, as I had left so many synagogues before, unobserved, unfulfilled, incomplete. It wasn’t until the afternoon that I finally found what I was looking for. I was walking through the Judaica section of Jerusalem’s spectacular Israel Museum, when I stumbled across something called the Horb Synagogue. I wandered in and found a treasure. The Horb Synagogue is little more than the ceiling of a wooden barn that had been brought to Israel from southern Germany. No more than 10ft by 20ft, it had been built in 1735 as a synagogue, though later it had become just another agricultural building. The walls had been too damaged to restore but the ceiling was a delight. Painted in a rich, folkloric style, every square inch of it was covered with animals, trees, rivers, cities and sacred symbols. I lay down on one of the benches to look at it more closely and heard a familiar sound. A speaker in the wall was playing synagogue music that would have been sung in Horb in the 18th century, music that by wonderful coincidence was still used every year at my own London synagogue’s service on the Day of Atonement. I closed my eyes and at last felt at home. Jerusalem-Horb-London: the connection suddenly seemed complete. Thanks to a phenomenal level of security, Israel is a relatively safe place to travel around but you do get a sense of constant, low-level carping between the Jewish and Arab communities. My guide in Jerusalem’s Old City was keen to point out how much cleaner the streets were in Jewish quarter than in the Arab part of town. He was right but only because Arab old Jerusalem is a bustling marketplace, jammed with stalls selling fish, meat, fruit, vegetables and spices. There is a danger that you can leave the country with a depressing sense of the impossibility of reconciliation. But in fact there are plenty of organisations working to bring the two sides together and one of them I stumbled across just north of the Old City’s Damascus Gate. Perched on the cusp between Arab Jerusalem and the ultra-Orthodox Jewish district of Mea Sha’arim, in a small, bullet-scarred building that before 1967 was a military outpost on the line between Israel and Jordan, is the Museum on the Seam. Established in 1999, the museum has a inspiring, semi-permanent exhibition of works by contemporary artists both from Israel and the Palestinian authority and from further afield, brought together under the theme of coexistence. There is plenty of painting, collage and photography here, such as “Clonexistence” by Sarajevo artist Lejla Bulja, dealing with war, oppression, changing frontiers and displaced populations. But, perhaps appropriately in this modern country, the most powerful pieces are the video installations. Near the entrance to the exhibition a monitor broadcasts looped footage of politicians shouting down their opponents – in television interviews, in staged debates, across the floor of the Israeli parliament – blocking out dissent and stifling dialogue. Israeli artist Miki Krazman’s “The Reality of Roadblocks” (2002) features seven hours of juddery images filmed from inside a car as it negotiates the militarised labyrinth of the occupied territories. But for me the most affecting installation was Tali and Ziv Reif’s “Love Thy Neighbour As Thyself”. You push a switch and three wall-sized video screens burst into action, enveloping you with cross-cut images of news footage of the 2000 intifada and the Israeli army’s response to it. Men shout, throw stones, open fire, protest and attack. Women look on, scoop up children, weep and despair. Everywhere is chaos, explosions, gun fire and police sirens. Both sides are hurt. Both go on the attack. I watched the film through three times. For the the first time I began to understand how hard it is for those who live in the region to see a way out of the conflict they find themselves in.